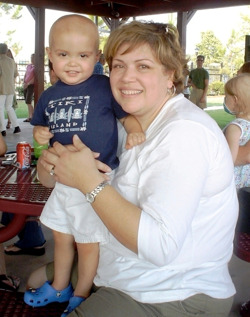 My son Victor was diagnosed on May 16, 2008 with Acute Lymphoblastic Leukemia. So many questions arose during those first few hours: What could be done? How and where would it be done? Within 24 hours my then 18 month old child and I arrived at St. Jude Children’s Research Hospital and Ronald McDonald House® of Memphis. In the days to come we would sit with other families in the common areas to watch television, have conversations or to watch our children play. Many nights families would converge in the kitchens to prepare dinner together and eat in the adjoining dining rooms. We witnessed the creation of extended families; strangers became acquaintances, then friends. The dining area became a community center allowing parents to sit down after dinner to catch up with each other about the progress of treatment, our days and to share news from back home. The staff at Ronald McDonald House® has always shown care, kindness and compassion to our family. I am very grateful for their efforts to provide safe, clean and comfortable housing for us. The outpouring of love that volunteers provided us with has also been wonderful. From the individuals who volunteer daily and greet you with a smile as you return to the House, to community and church groups that commit their time and efforts to help families feel at home while staying in Memphis, we’ve met some truly amazing people. Volunteers at Ronald McDonald House® come from all over and help maintain the facilities, help sanitize the toys, bring games or entertainment for the children, cook and serve meals and provide parents with a much needed break. By the end of each long day we all witnessed our children, who are facing such challenging odds, forget the reason they were there and just be children – laughing, playing, delighting at a magic trick, shouting out BINGO! or singing along to a song. What a priceless gift the staff, volunteers and organizations gave us without expecting anything in return! It is truly a humbling experience to think that so many who do not know us would give so much of their time and resources simply because they believe it is the right thing to do. I personally know that we have been able to come this far because of the care and love we received while we stayed. I hope that one day my whole family, with Victor in the lead, can come back and follow the example of all these wonderful people. THANK YOU ALL for opening up your hearts and giving so much of yourselves. Your efforts truly ensure that Ronald McDonald House® will continue to operate in the spirit of LOVE that built this “home-away-from-home” for so many of us.